I don't know this serie but your wall is just amazing, I love the soft light effect you've used. It gives a peaceful aura to the scene, the perfect illustration of the warrior's rest. Really sweet and beautiful! Thank you sharing this amazing piece of work with us! really nice vector. you did a great job. What i like the most is your discription with the progress picture. Was it a lot of work to do this progress thing? This is beautiful! The painting is so soft and you did a great job on the vector. The only negative is that the outlines for his bangs are very jagged. Other than that, fantastic work! i wish i can do something like that! but i noticed the jagged lines on the bangs part in the full view. 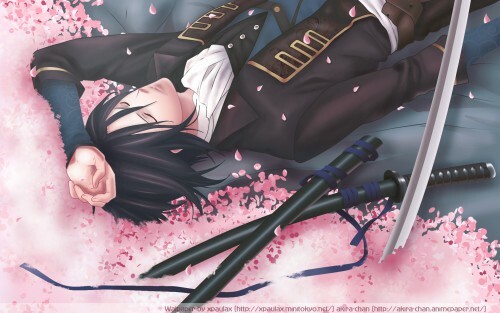 so beautiful.. though i thought it was hibari..